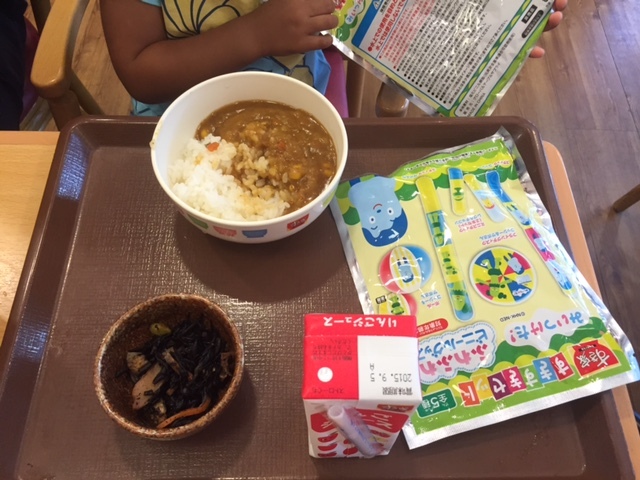 One of the main things which we were worried about when it came to visiting Tokyo with the kids, was food. 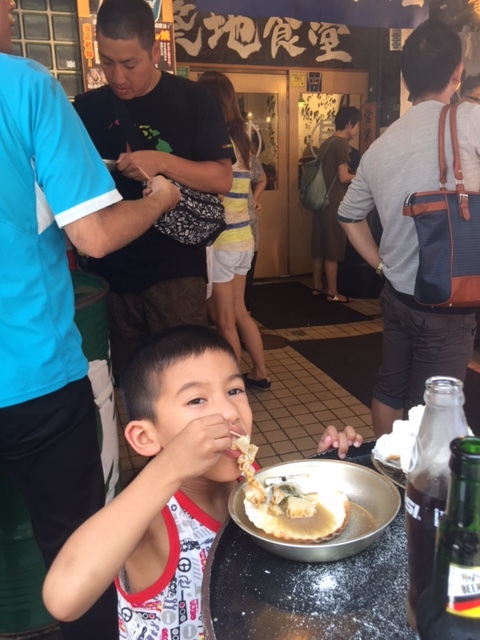 We heard that most places in Tokyo or at least those that would be serving the more ‘authentic’ Japanese experience, would not be too child friendly (think small places/ no high chairs/ unfriendly chefs/ zero tolerance for kids who make a pip). So how do we ensure that we get a decent experience (i.e no fast food) but yet feel welcomed and have the kids enjoy themselves. 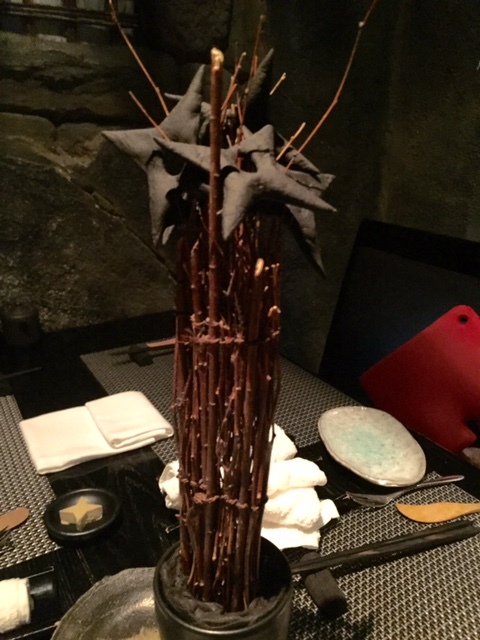 Upon entering, your Ninja guide would take you through the ‘village’. Through trap doors and door ways with low beams and ceilings. Lots of bending down and going down narrow stairways before you eventually reach the main dining room. It was all very dark so please excuse our photos which were all taken in a very dark restaurant. Oh and we couldn’t take any photos of our ‘journey’ through the village for fear of falling. We prepped Jah way beforehand for fear of his reaction to the ‘scary’ ninjas and the dark restaurant so thankfully he was perfectly fine and loved the experience. However we totally forgot about prepping Bella, actually it would have been quite impossible to prep her. She was and is still currently in the phase of “I’m scared of everything” (come on! 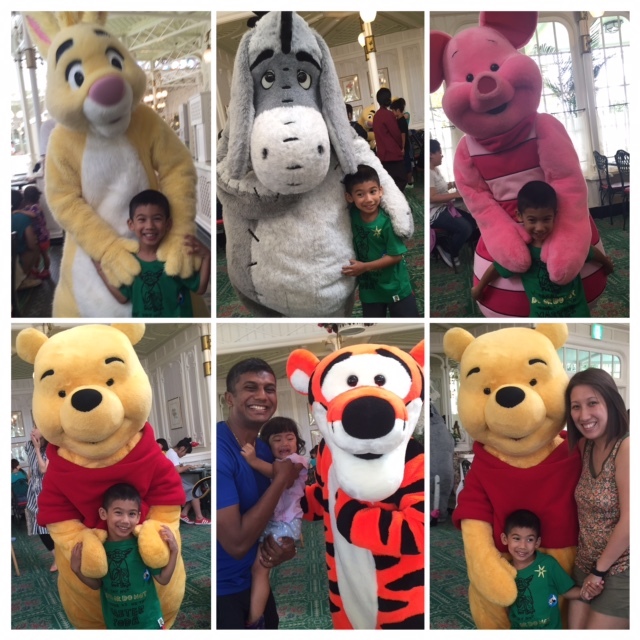 She was even afraid of standing next to cute ole Winnie the Pooh at Disneyland..sigh). So there was a bit of resistance from Bella and she insisted on sitting on Joel’s lap through the entire meal which was well not the best dining experience for him. Don’t be fooled by this peaceful moment…Bella was super jumpy! Thank goodness for a private area! 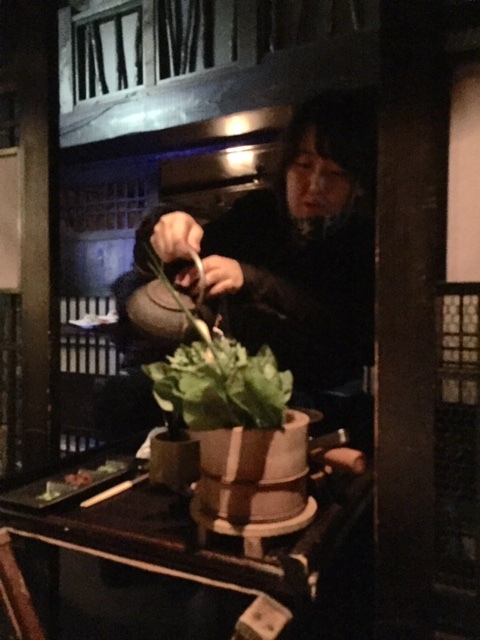 We ordered their 2 sets of their Tasting Course as well as their Jyubei course. The courses were delivered one by one and only after you have completed each course. So you would probably buffer about 2 hours for the meal. The food was good! Some dishes probably alittle ‘stranger’ than I would have liked but we all loved their beef. 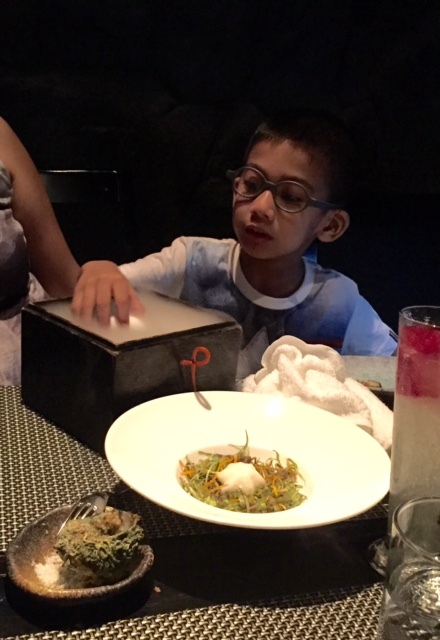 In fact the kids were fighting us for the only course of beef that we ordered..grrrr…We didn’t take photo of a lot of our food because we were so caught up in eating, the entertainment and also with pacifying with Ms Bella so honestly the food photos don’t do the meal much justice. Yes..all edible! Jah was made to believe that they gave him Ninja power! 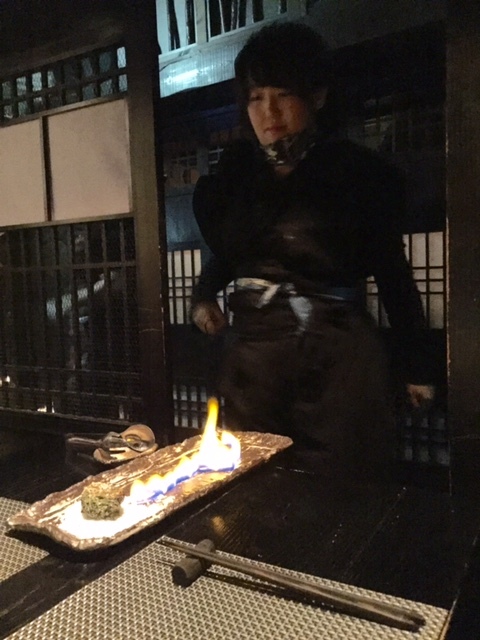 Some of the courses were accompanied by a bit of fanfare – like dry ice coming out of a ‘treasure box’ which they would ask you to open and also get you to crack the magic egg, or a ninja sword display before you were served your next dish as well as some drama as your ninja server prepares your stone boiled soup. Dramatic Sword Display with fire! 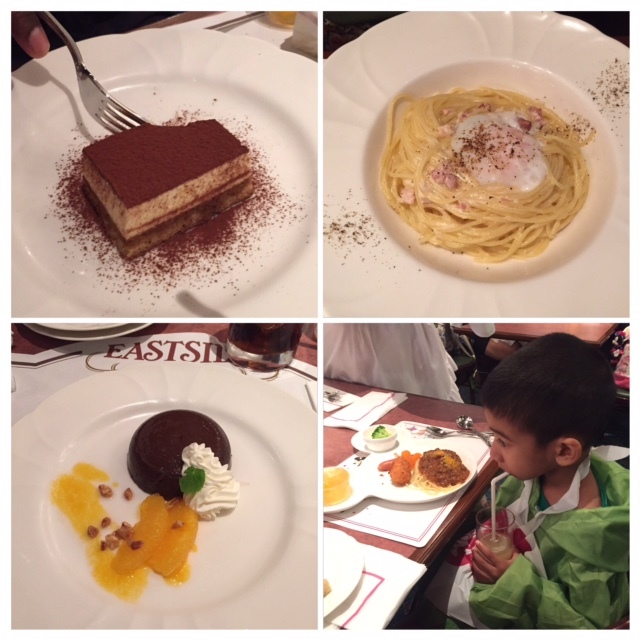 What impressed me about the experience was the fact that the show didn’t just end with dinner. 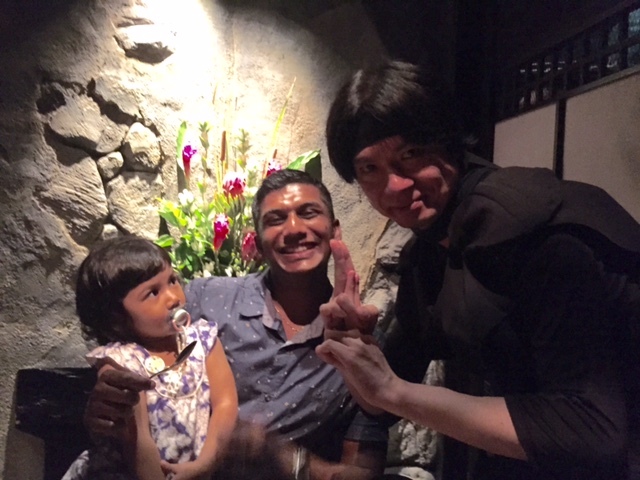 Our Ninja server engaged us and the kids all the way as she was escorting us out of the ‘village’ and even needed Jah to help perform some ‘magic’ before the door would finally open to let us out. 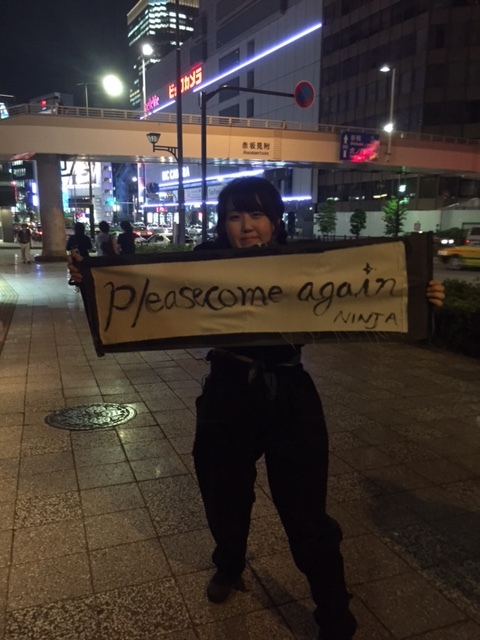 They even took their act all the way to street level as they bid us goodbye. 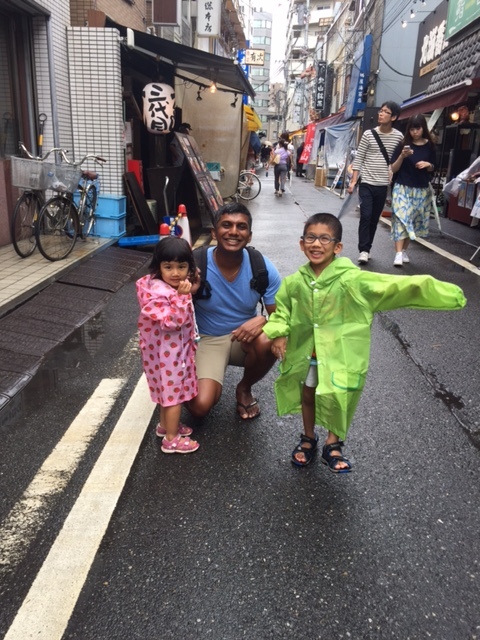 When I told people that we were intending to holiday in Tokyo with the kids for 11 days, most were surprised and then skeptical. After all what was there to do in Tokyo with 2 kids under 4, besides the whole Disney thing and that definitely does not take 11 days. 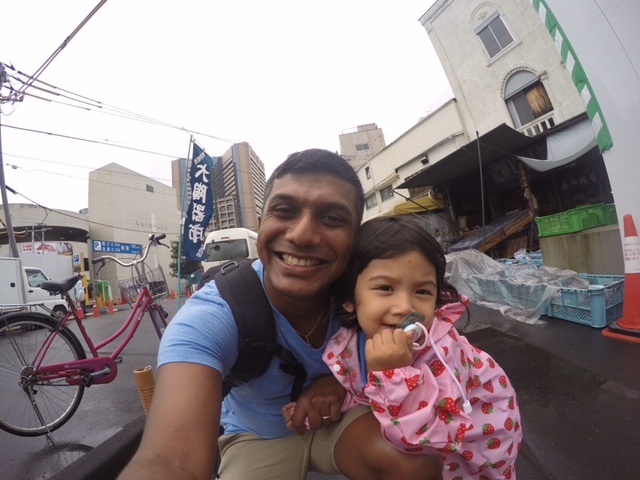 For those who are wondering or who are even considering Tokyo as a holiday destination with kids, I can assure you that we found some absolutely kid friendly stuff to do and were able to adapt some adult stuff to suit the kids. 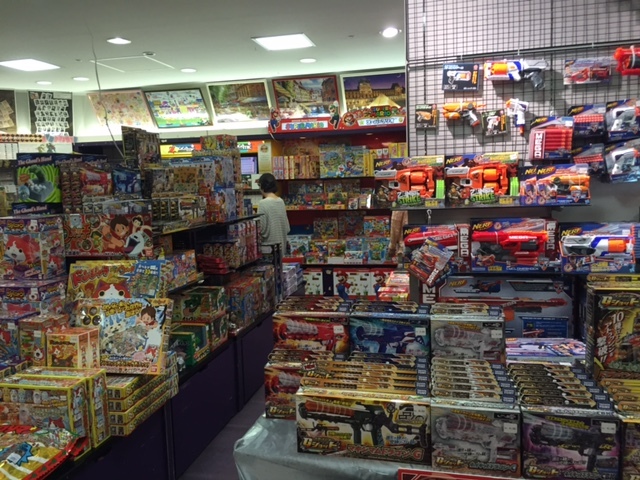 In fact we found a lot more kid friendly stuff than we eventually attempted. 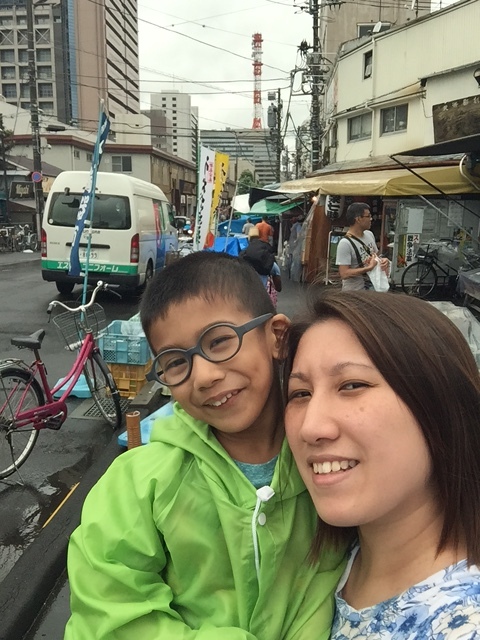 Our first morning (after a full day flight and a good night’s rest) brought us to Tsukiji Market. 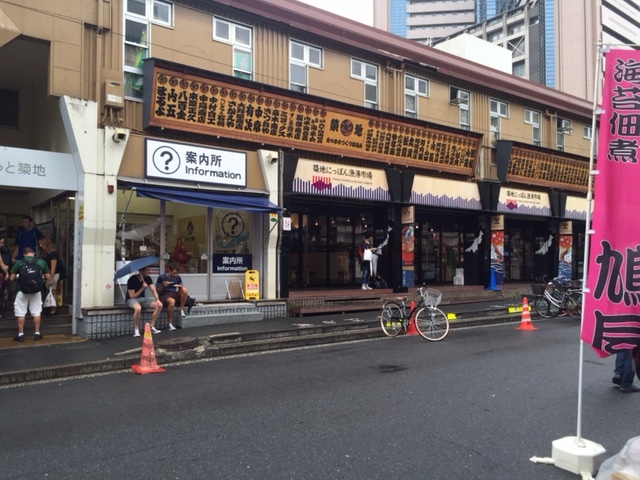 Yes Tsukiji Market! 🙂 Joel and I really wanted to visit the fish market but were unsure if the kids could cope in that bustling, wet and chaotic environment. We decided that we did not need the ‘full experience’ of a fish market early morning auction but just really wanted to take in the touristy ‘retail’ market part of it. 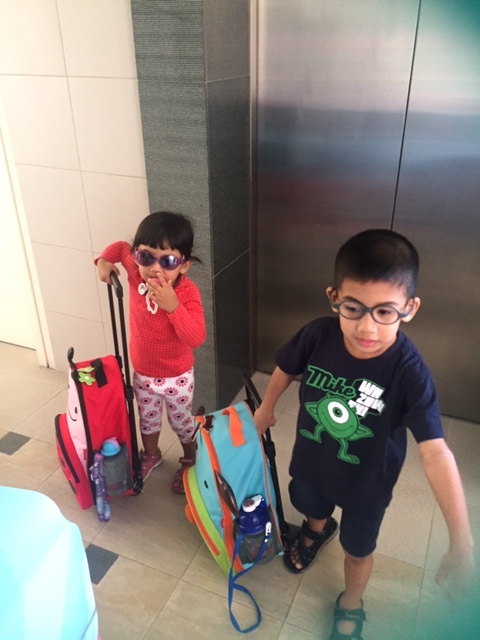 We travelled relatively light with only a backpack that contained our raincoats, 2 toddler carriers as well as the spare clothes, diapers, pee bags and wipes needed by the kids. 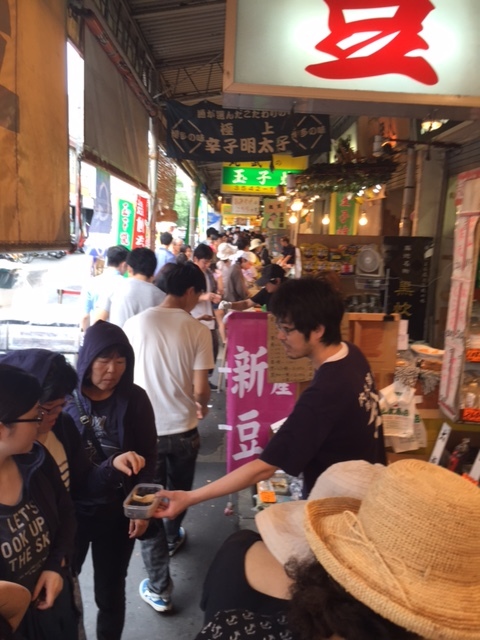 We finally got to Tsukiji Market and what is known as the Outer Market which is where all the retail touristy stuff take place. I was quite surprised that Jah and Bella were quite adventurous and were willing to try out random food that we passed. Mummy!! 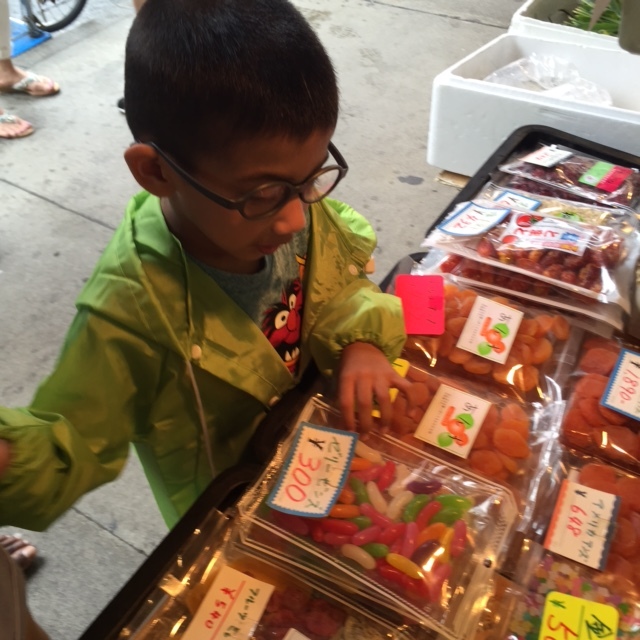 They sell jelly beans at the fish market! Can we buy? Perfect for a hot day! 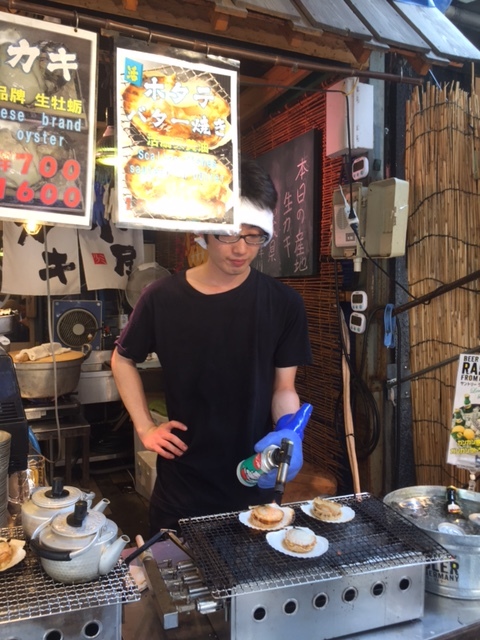 Yes the 2nd trip to Tsukiji Market was blazing hot! 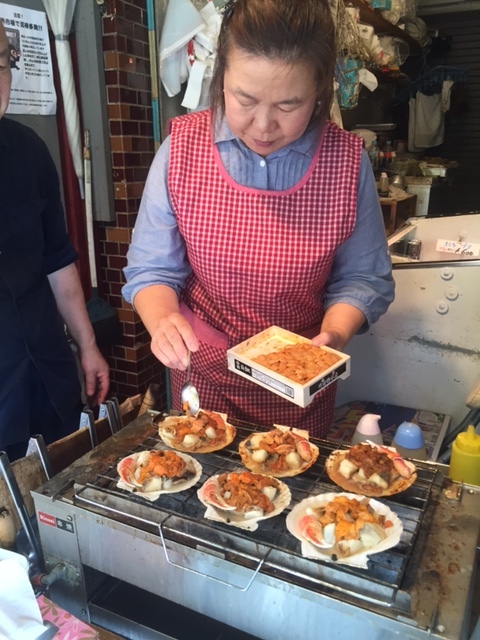 We taste tested Tamagos (egg) from random stalls (these stalls are a dime a dozen) and we were so intrigued by an old couple grilling huge scallops that we had to stop to try. 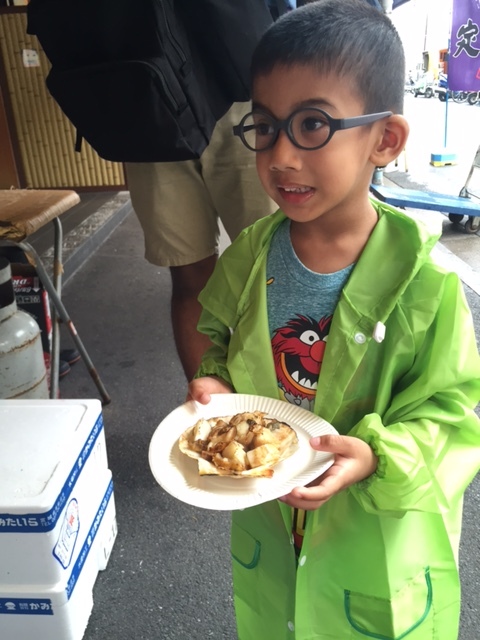 It helped that the stall was well-sheltered and we could take our time to finish our piping hot scallops. Jah loved it so much that he slurped every bit of it including the ‘sauce’. 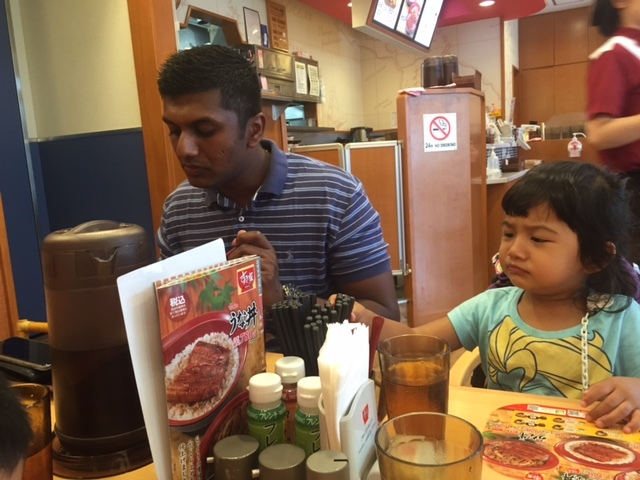 In fact, he loved this new found taste and food so much that we had to later stop at another shop to order a second round. 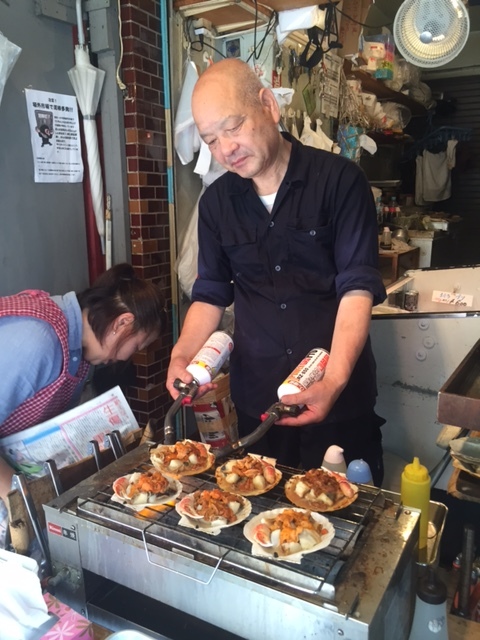 This time round, we had scallops in butter as well as large oysters that were super cheap. This shop was connected to a restaurant so we were able to order drinks and beer to go with our food and we stood around a huge barrels which acted as tables. 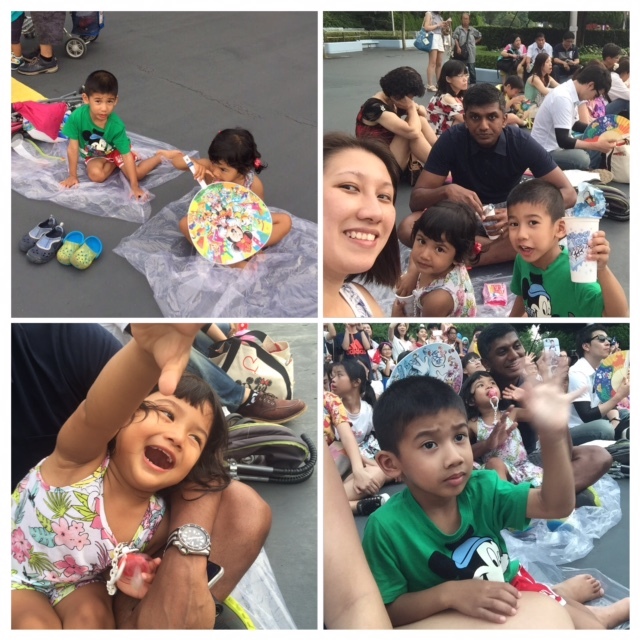 Quite the experience for the little ones! 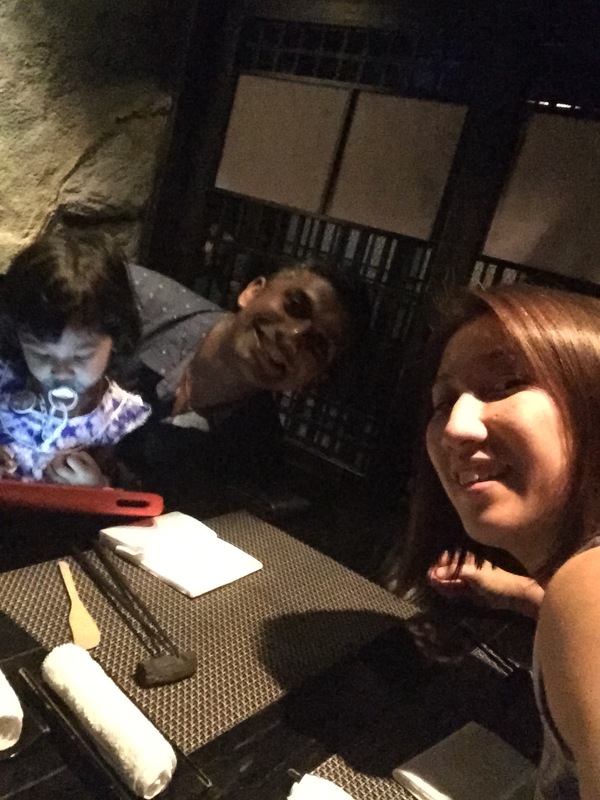 In fact the reason that we came back a second time (aside from the fact that Joel and I wanted more yummy scallops), was because Jah and Bella loved it so much that they wanted to come back too! Who would have thought right? 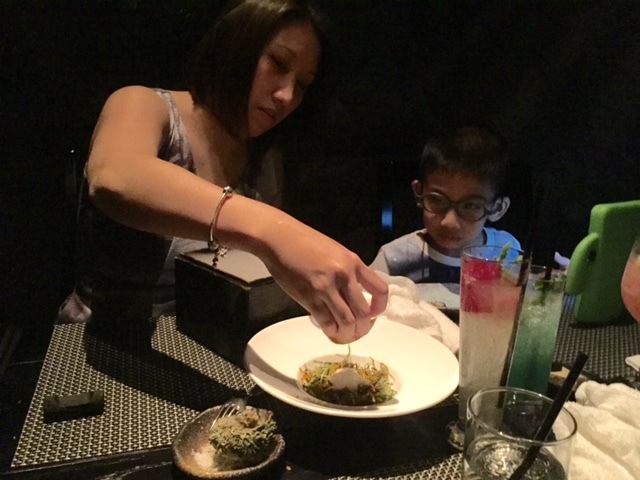 Aunty adding uni to our scallops! 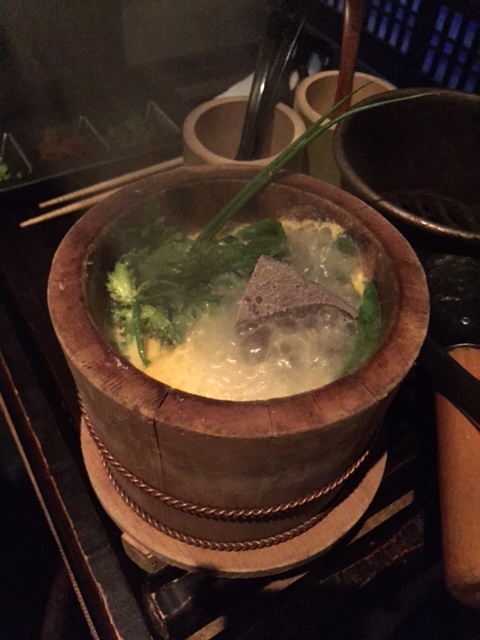 There were crab claws in there too! Time to cook it!! Yummy! Mummy can I eat it already? We proceeded to a random restaurant for lunch after, even though we were already quite full from all that snacking. This is supposed to be Sushi/ Sashimi restaurant paradise so I wasn’t leaving until I had my sashimi lunch. However our random lunch turned out to be really disappointing and expensive so I guess nothing to rave about here. It was almost 11am by the time we were done with our early lunch and Jah was insisting that we proceed to something that he wanted to do. :p A toy shop visit! 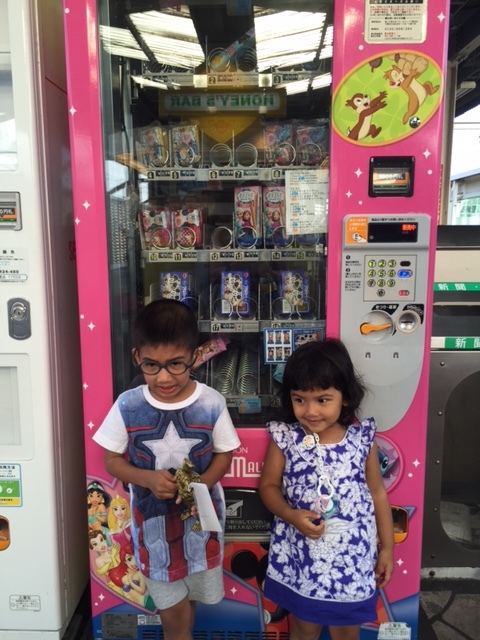 So with my Google Map in hand, we made it back to the train station and headed to the Hakuhinkan Toy Park at Ginza. Time for the Toy Store! Yay! 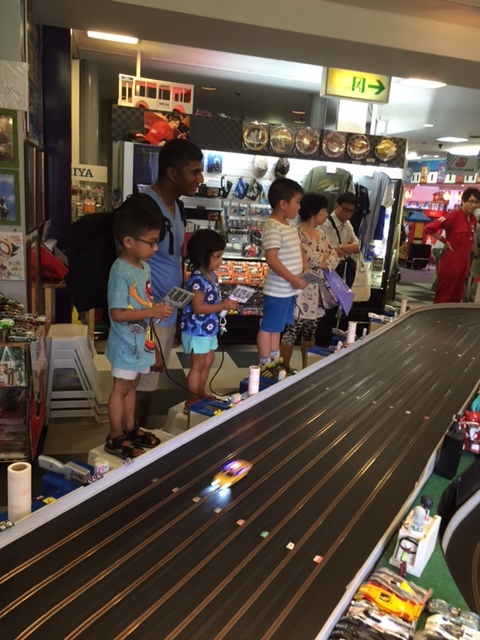 By the time we made it to Hakuhinkan Toy Park (It was a really long way *sweat*) It was almost 12pm and there were levels and levels of toys at the Toy Park so needless to say the kids were occupied for quite abit. 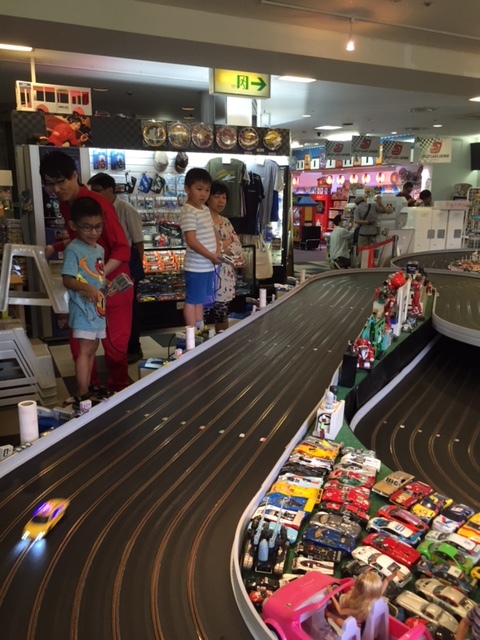 There was even a car race track that you could pay I think approximately $1 to $2 to play for about 15 minutes. The kids loved it and wanted to go many times over. Oh wow..where do we begin? Choose a car..pay for your game and race away! Bella could not resisit a few rounds too! After the tough decision of having to decide which flight configuration and flight timing would work for us, I had another dilemma looming in the horizon..where to stay in Tokyo? Here are some of the options we had and the rationale/ pros and cons behind each one. 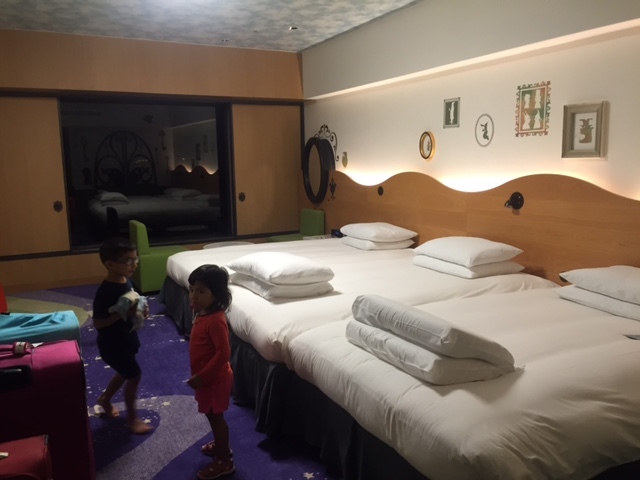 Stay at a Disney Hotel for 11 days. 😦 Visiting Tokyo on the other 7 days would be a hassle, with multiple train stops and at least 45 minutes travel time each way. Stay at a Disney Hotel for half our trip and move to a city hotel for the other half. 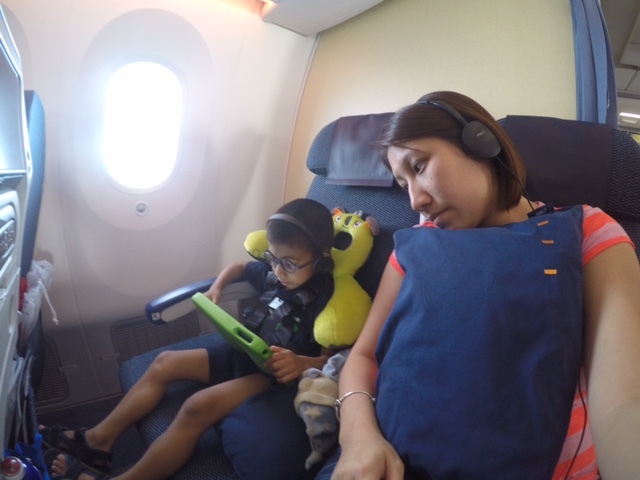 We eventually chose Option 1 which I know is probably not the most popular choice but we really cherish our naptimes :p (well rested kids = happy kids = happy parents) So yes we chose to struggle on most days and manage our itinerary within means. 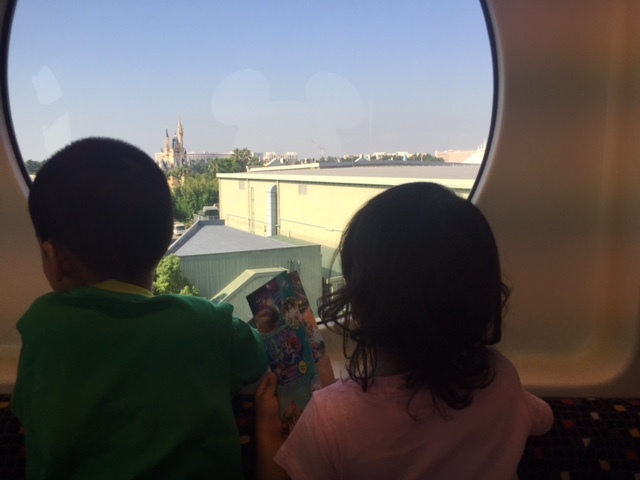 We ended up booking a room at Hilton Tokyo Bay which although is not an Official Disney Hotel (The Disney hotels are connected to either Disneyland or Disney Sea) but it was fairly well-connected by a monorail line which served the Disney area (think our local LRT). 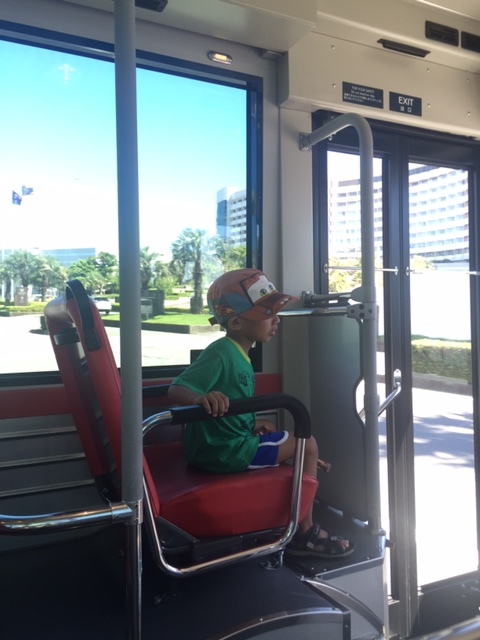 The hotel provided a free shuttle service to the nearby Bayside monorail station. We would usually take the shuttle bus to and from Bayside except at night when it tends to get really crowded. For those peak times, we would opt to take a nice slow 5 minutes stroll to our hotel. 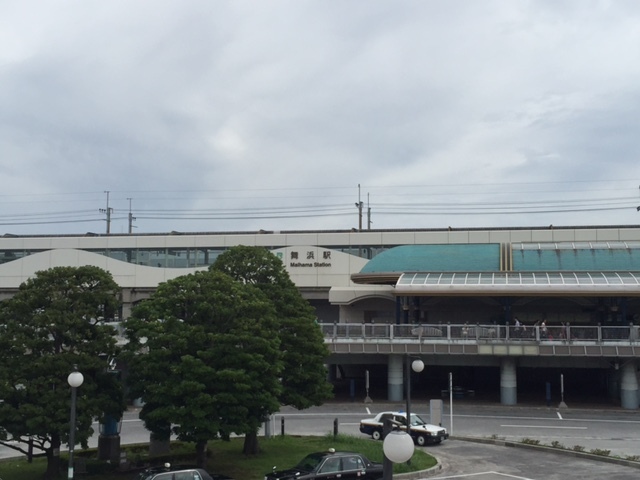 Bayside monorail station would bring you to 3 other stations – Disneyland station, Disney Sea station and the main Maihama Station which would connect you to the greater Metro lines. The monorail takes about 15 minutes to complete an entire loop so it was really convenient and fast! 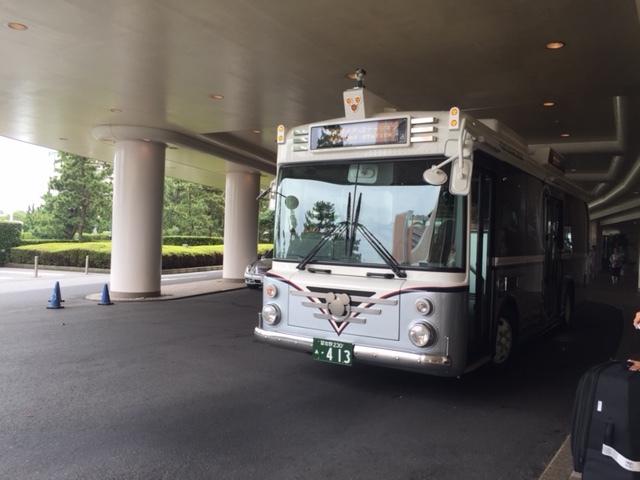 The hotel also provided a direct shuttle service to Maihama Station for those who are heading out to the city. This was how we travelled out to the city on the other 7 days. 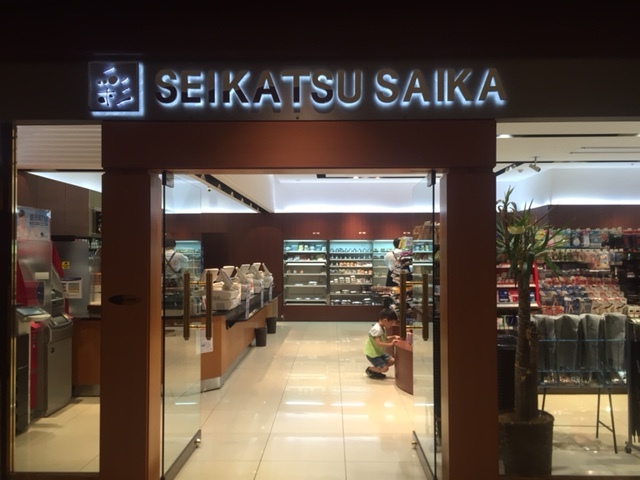 This is also where you would find Ikispiari Mall, where we settled a lot of our meals when we were not heading out to the city. 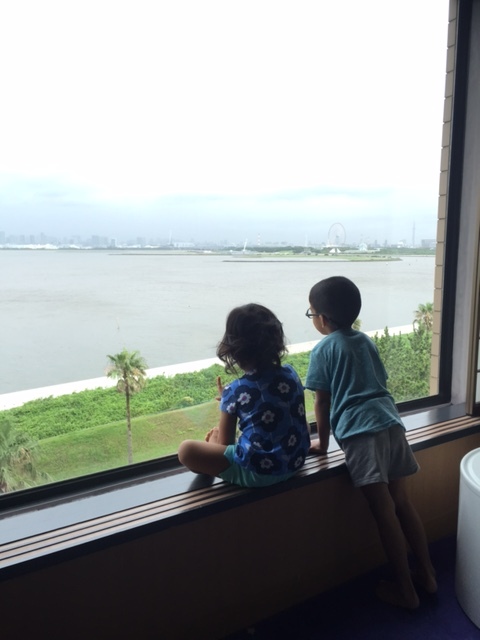 The Hilton Tokyo Bay had several room types – 1 of which was the Happy Magic Room. The Happy Magic rooms are situated on their own level which was decorated in a Magic Forest Theme. 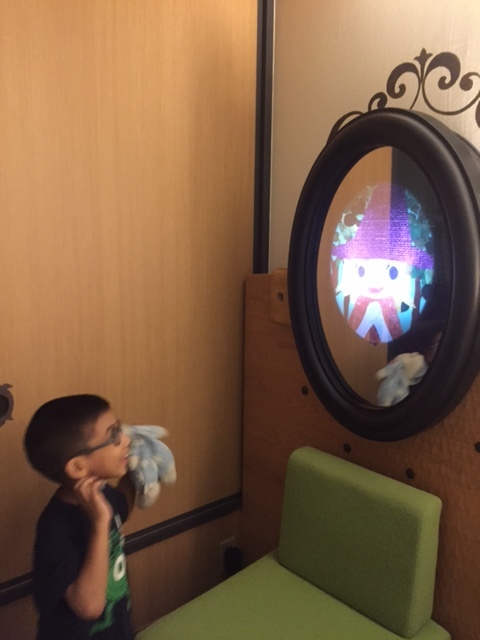 It was a real treat for the kids and they would ‘greet’ the little dragon 3D holograms found near our lift lobby every time we took the lift. 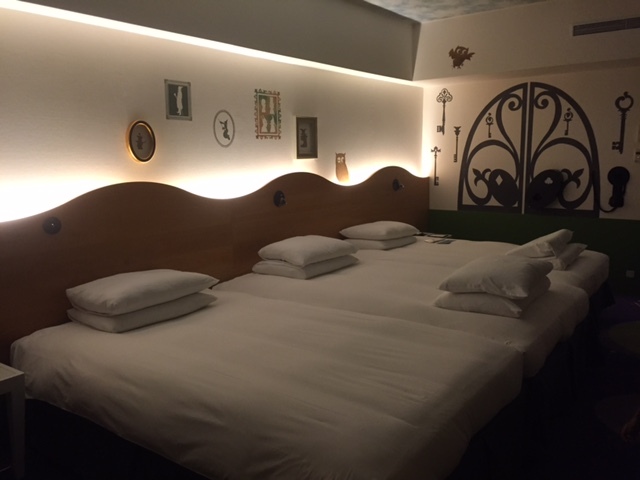 The room we had was really awesome for 3 main reasons. The room was HUGE compared to many of the city hotels in Tokyo and honestly even Singapore!!! Yes, we had 3 queen sized beds put side by side and so we didn’t have to squeeze or worry about rolling off the bed. There was also ample playing space for the kids and our huge suitcases. There were little tricks in the room to entertain the kids, like a magic mirror and a giant key to unleash the ‘magic’. 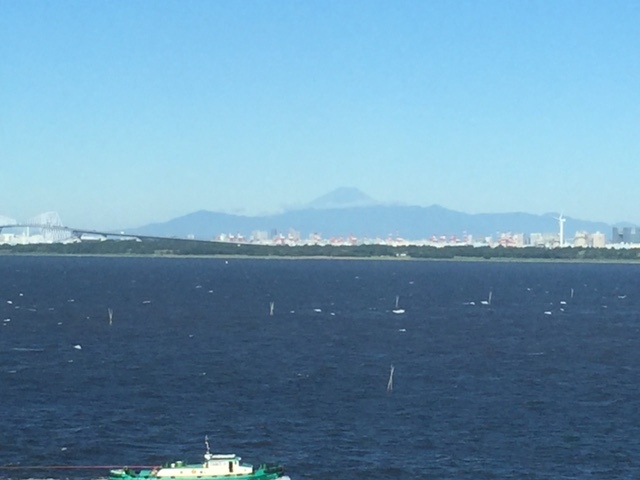 We also enjoyed our 180 degree sea view which offered us a glimpse of Mount Fuji on a nice clear day. The Hilton Tokyo Bay is a real value for money hotel especially if you book early..:) (Think $300 a night vs $900 a night!) It is after all a Hilton right? 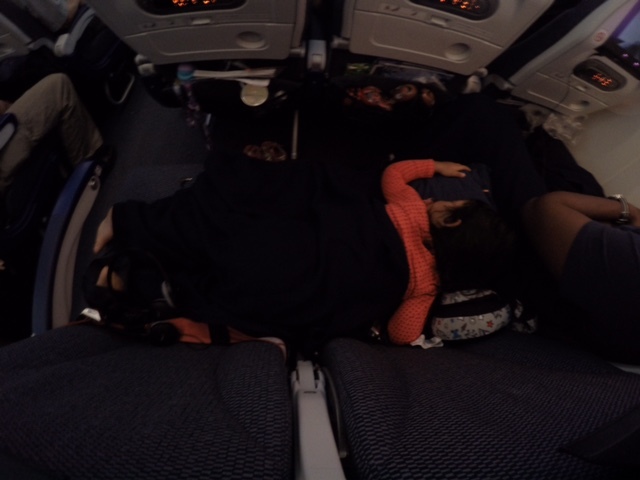 So of course the first hurdle to cross would be enduring that 8 hour flight with 2 kids.! Honestly I wasn’t really worried about dealing with Jah, he is getting pretty good with this whole airplane thing and I was even contemplating doing without our CARES Harness for him. But Bella…oh Bella is a whole different deal…we don’t call her Miss Ants-in-her-pants for nothing. Miss Ants-in-her-pants…thank goodness she was only annoying the people behind her…Jah and I! Planning this trip a year in advance left us with a lot of time to second doubt our decisions. 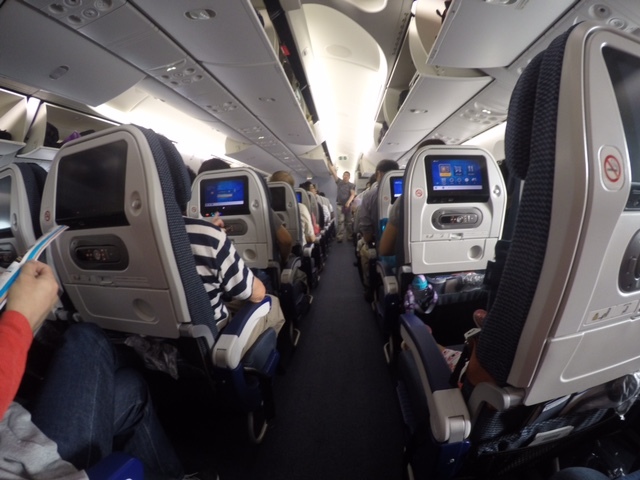 We went back and forth with our choice of airline as well as the aircraft configuration and flight timings. 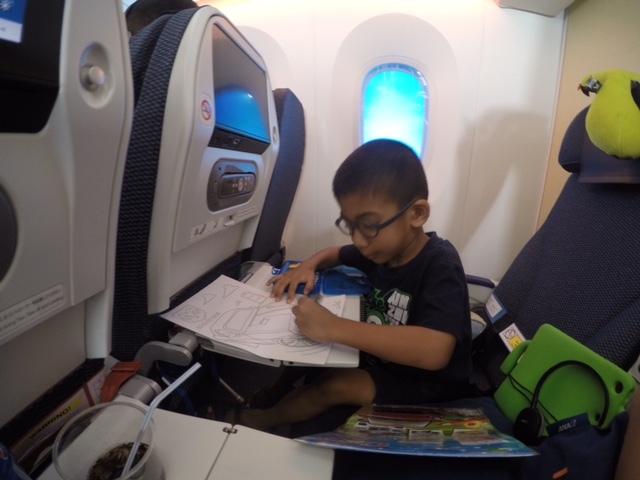 Yes lots of thought went into choosing the PERFECT flight and while I would say it definitely wasn’t perfect…we learnt quite abit from our choices. We were fortunate to snag a last row seat for Jah and I, which was a 2 seater and prayed very hard for Joel and Bella to have an empty seat next to them. 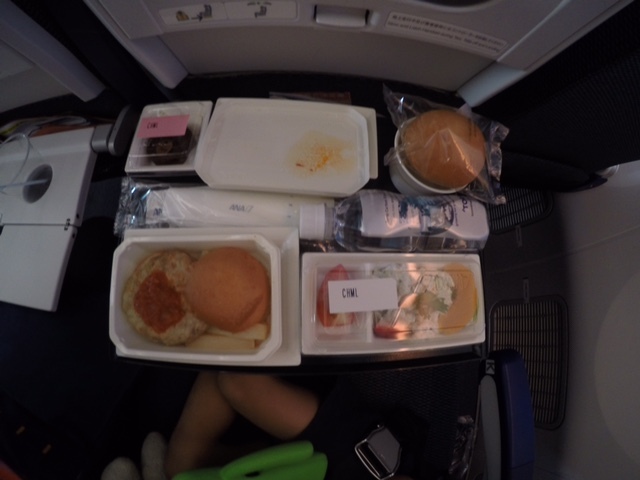 3-3-3 Config..fortunately Bella and Joel had a free seat next to them on this flight..not so lucky on the way back! 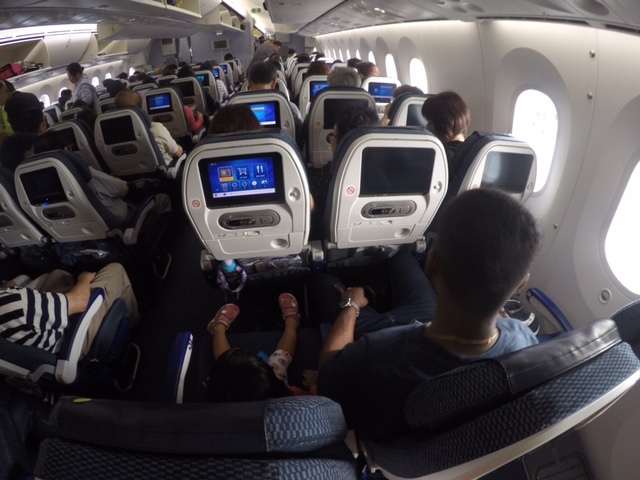 So how did our flight on ANA go? Joel and I had pretty different takes on it. 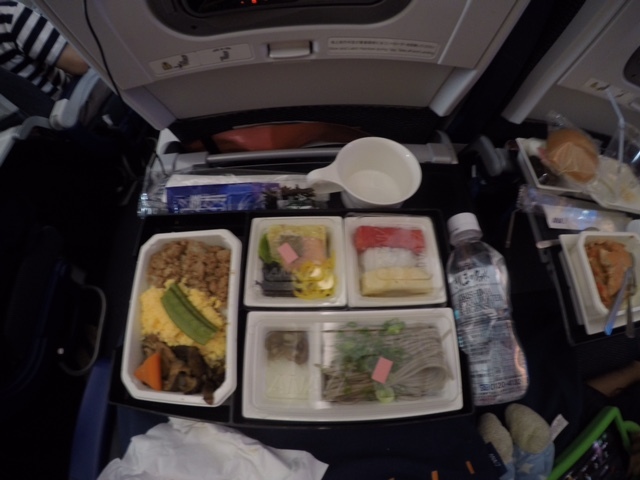 He was really impressed by the service on ANA. 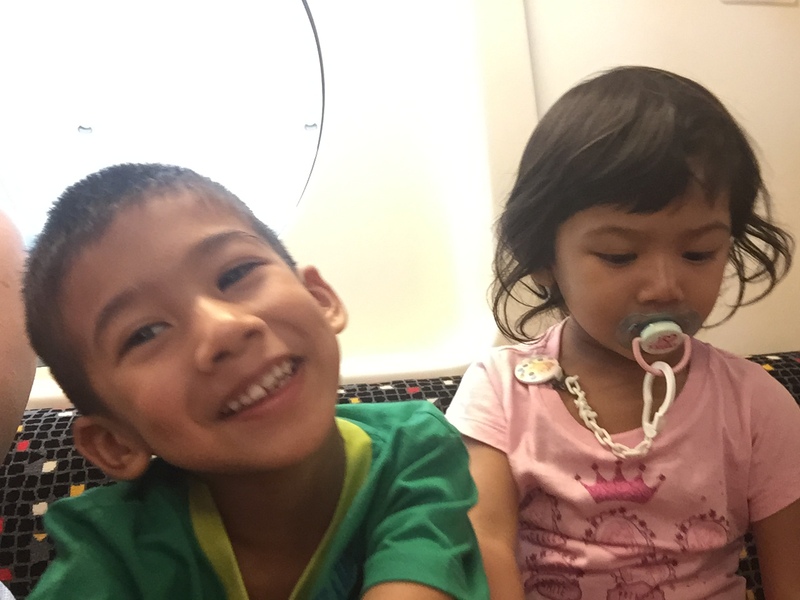 He felt that it was personal without being intrusive and that the cabin crew were very ‘sincere’ and understanding when it came to their little passengers. 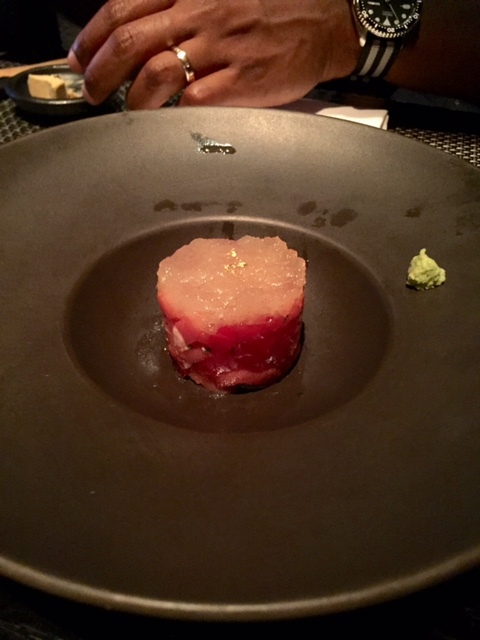 However the food left much to be desired and I would have to agree with that. 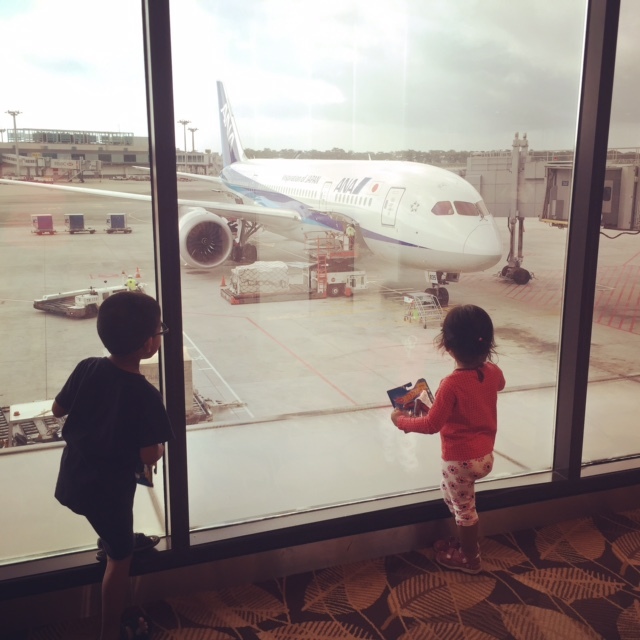 So what flight timing works for toddlers and little kids you ask? Well it really depends on your kids. I know of some people who swear by red eye flights so that they get in bright and early and don’t waste a day or have to cope with wide awake kids on the flight. 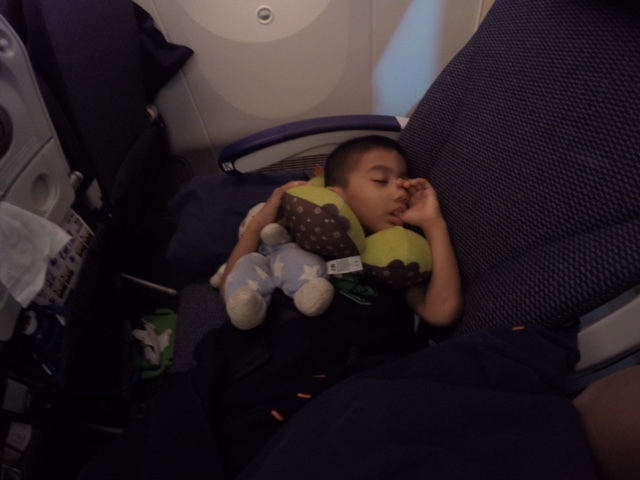 2nd kid napping!! 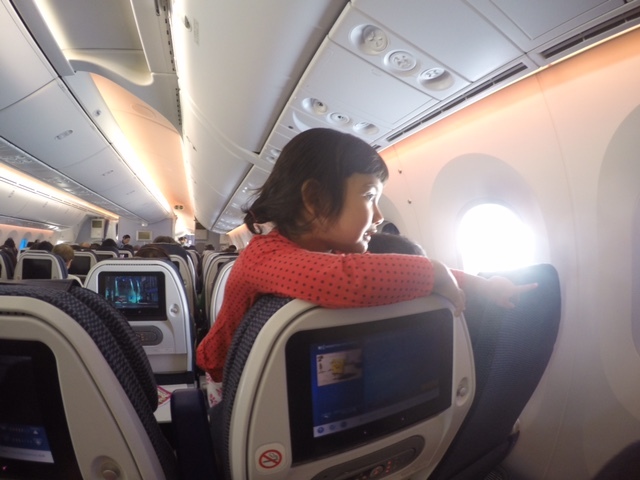 This was after I successfully transferred her from my carrier to the plane seat.. They finally woke at about 4 to 5pm (yes they slept for 3 hours!!!! I couldn’t believe it myself!!) and this meant we only had to deal with them for another 2 hours before it was time to land! So yes awesome flight choice! Remember to bring lots of activities to keep them occupied! We contemplated having a full day flight for our return flight but that would mean being at the airport by 9am. 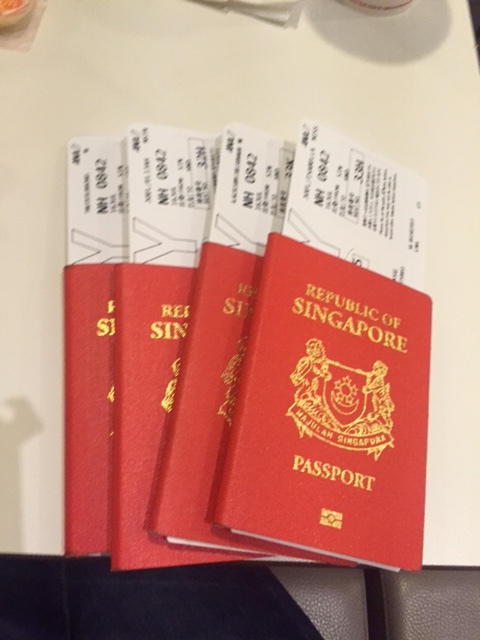 Perfectly do-able if we were coming from home but just too stressful a task coming off a holiday so we decided to take the red-eye flight. This gave us a full day in Tokyo with enough time for a good dinner and kids who are showered and ready for ‘bed’ on the flight. Perfect in theory for us but not so perfect in execution. We definitely appreciated the full day in Tokyo but because our flight only departed at midnight. The kids had to be up and about in the airport till that time. Bella fell asleep in her carrier from 10pm to 12 midnight and then was wide awake once we were onboard the flight. OMG! I was fortunate that at least 1 child slept (Jah slept from 1230am to 5am) and only woke because the lights came on for breakfast. We struggled with Bella and only got her to sleep momentarily. 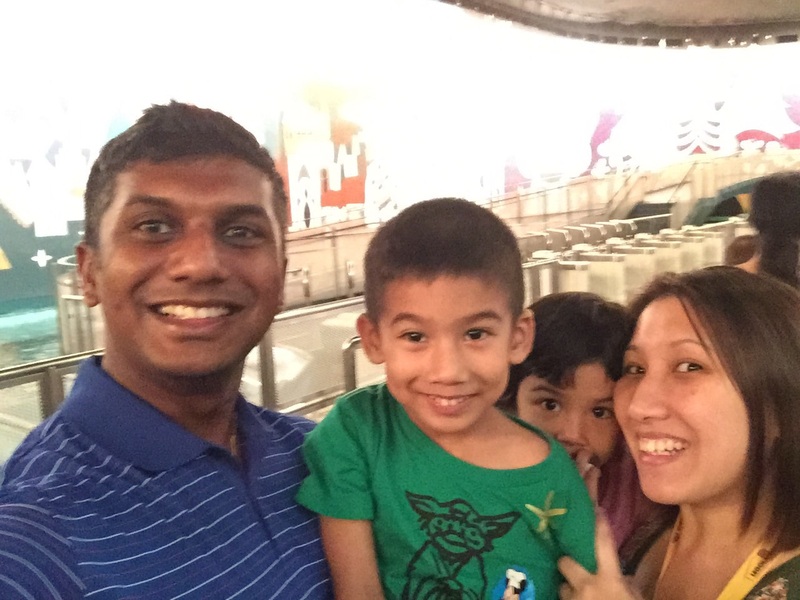 The upside to having the red eye on the return is the fact that at least we were on homeground, with two zombie-fied parents dealing with a cranky toddler and a super re-charged kid. 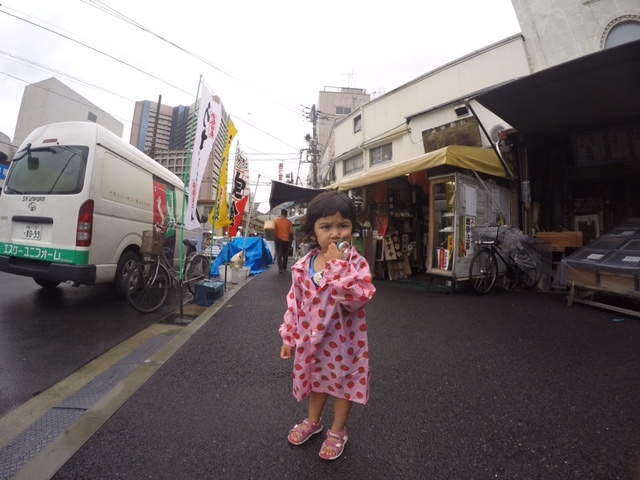 Stay Tuned for more posts on what we did on our Tokyo Trip with JahBella! Bring your own strollers. 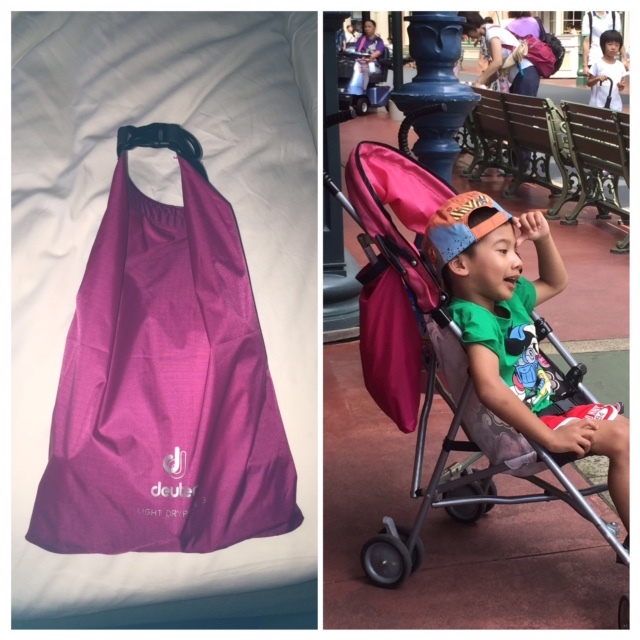 While you can rent the strollers from the park at 700yen a day, we chose to bring our own strollers. 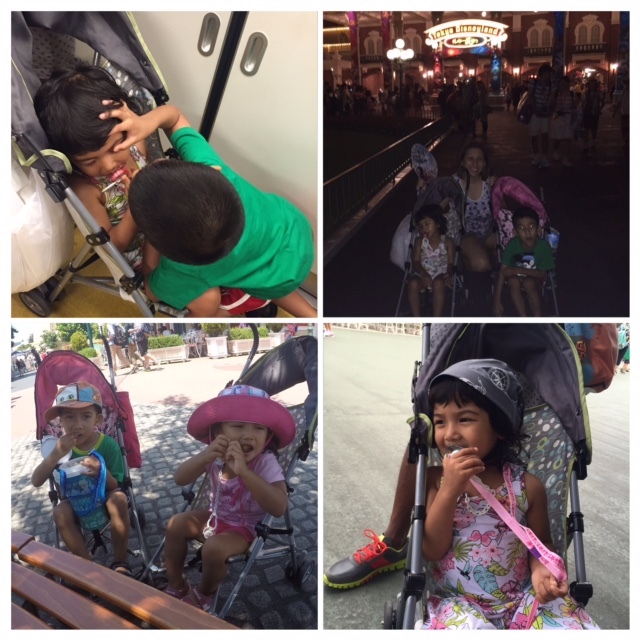 Strollers will come in handy when your kids are exhausted and so are you! You can also use them to hang your belongings while you go for your rides. There are designated stroller parking next to every ride and staff on hand to keep a watch and re-arrange the strollers neatly. Take note though that most shows and parades are ‘sitting shows’ which will require you to collapse your strollers during the parades and shows so bring something lightweight and easy to collapse. Pack light and pack waterproof. Don’t bring huge bags that will slow you down or be ultra cumbersome. 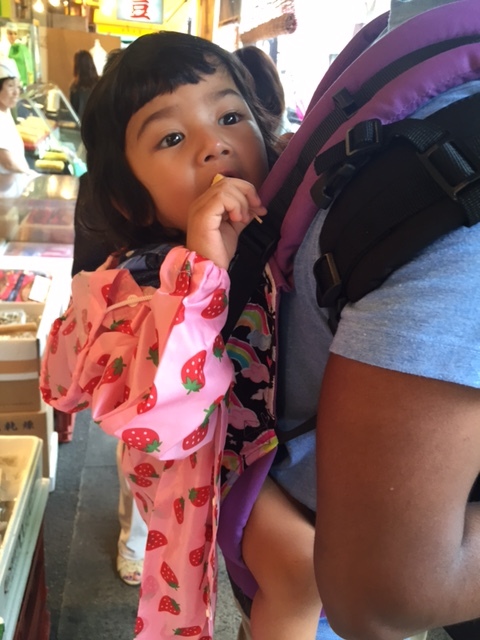 We bought a waterproof Deuter ‘pouch’/’bag’ before our trip and it was very handy to hold our tickets (which we further protected with a Ziploc bag), our overseas Wifi router, 2 pieces of diapers and Jah’s Travel John Junior pee bag. 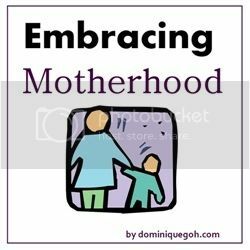 It was easy to hang it on 1 of the stroller when on the move and just as easy to hold onto it when we parked our strollers and went for rides. Use lots of sunscreen lotion or try the sunscreen sprays. 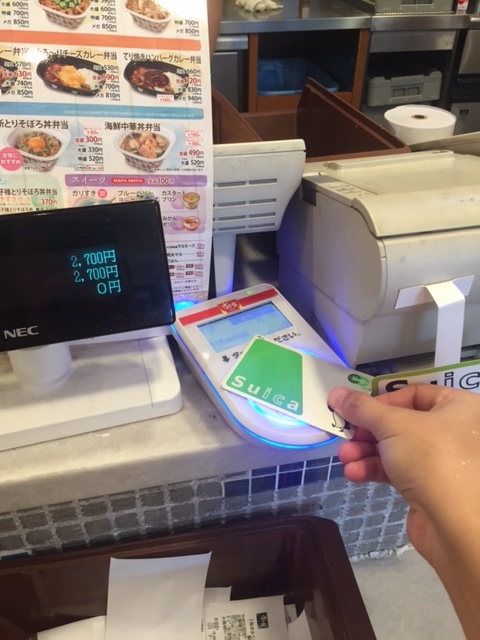 Remember to slap on your sunscreen lotion or bring along some sunscreen sprays which can be found at most supermarkets or drug stores in Tokyo. 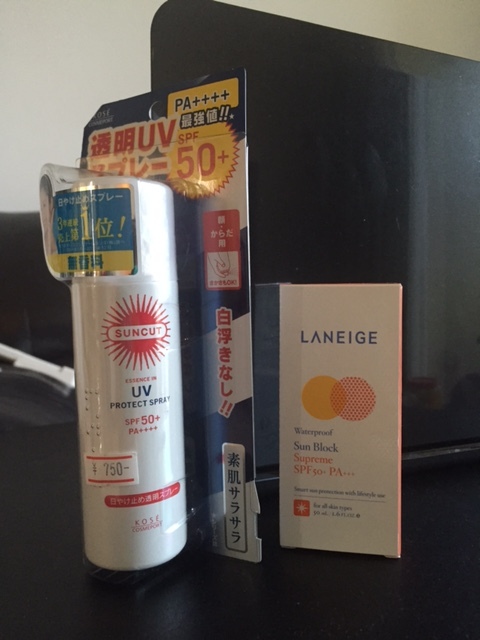 We were under the hot sun a lot but the Laneige sunscreen lotion which we brought from Singapore (which by the way smells awesome) plus the sunscreen spray which we bought in Tokyo were our saving grace. For people who burn really easily, we were perfectly fine just from using these 2 products. Don’t avoid Disney even if it rains. Well unless it’s a torrential thunderstorm, I would say raincoats and windbreakers will easily do the trick. 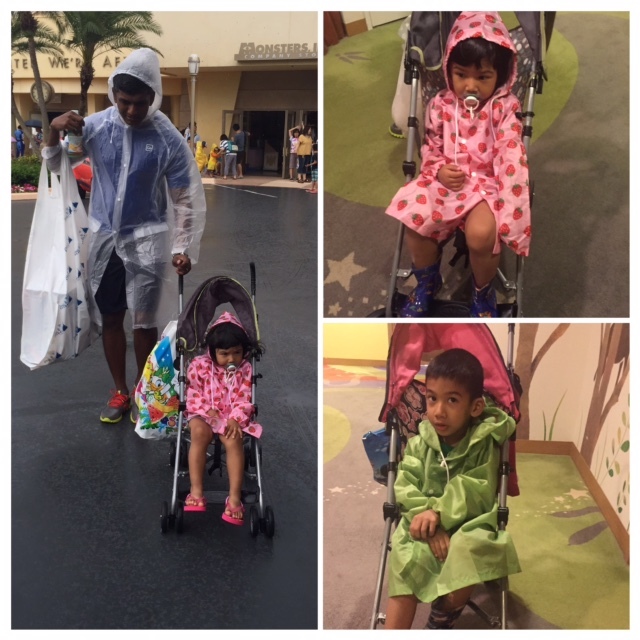 So arm yourself with some raincoats especially for the little ones and don’t let the weather put a damper on your Disney Spirit. Check the crowd calendar. 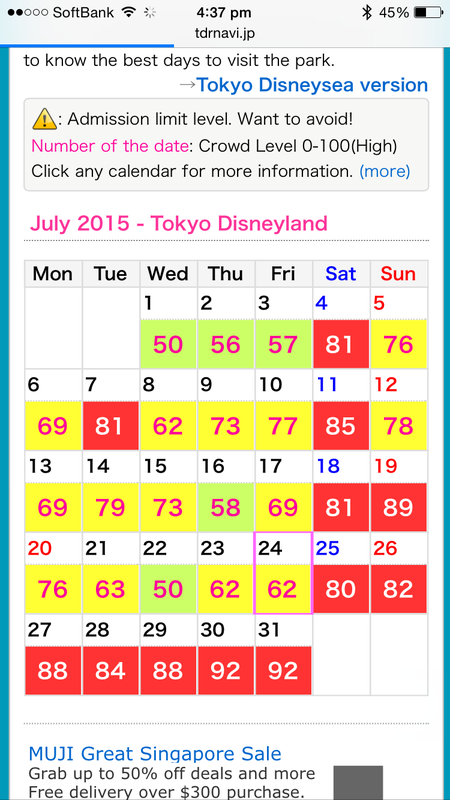 There are crowd calendars online which gauge the crowd levels on any given day for both Tokyo Disney Sea and Tokyo Disneyland. The crowd levels get more accurate as the day approaches. 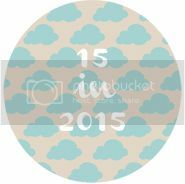 We used Crowd Calendar and we were there when crowd levels were supposedly between 60 to 65 and had very manageable queuing times especially for the kiddy rides in the evenings. Waiting times were 20 minutes to none at all for some rides. Take it easy and don’t queue for an hour before opening time. If you are going on a relatively low crowd level day meaning 50 – 70 then I would suggest taking it easy. Don’t queue up to an hour before opening time like people say they do. Get there at opening time or within 30 mins from opening time and you will still be able to make it in fine and get your Fast passes. Standing in queue for 1 hour before the park opens is not going to help much except for having half tired and cranky kids by the time the gates open and it is also a sure-fire way to ensure snappy parents J:) However if you are going on a weekend or a red alert day (See crowd calendar) then I guess you will have to strategise how you would like to queue, wait and rush. 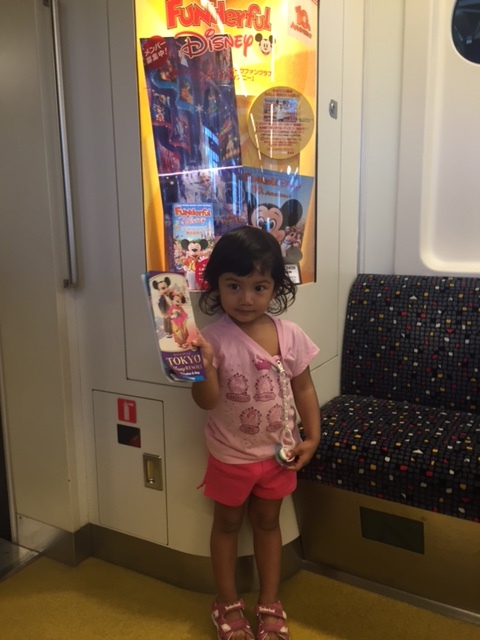 Aim for 1 Fastpass each morning and go collect it as soon as you can. Our crowd level was in the 60s range and we ‘strolled’ in within the 30 mins of the park opening and always managed to secure a Fast pass for the 10am to 1130am range. After completing that ride or just before we head back for our nap, we would go collect another Fastpass (Usually for the same ride) and usually end up with a 6pm to 8pm time range. If you are going on a day where the crowd level is higher than perhaps your Fastpass timings might be later or might run out early. We had Fastpasses for rides like Monsters Inc, 20,000 Leagues under the Sea and Astro Blasters in fact we took Monsters Hide and Seek (4-5 times!!!) Some rides are more popular than others and you can use the “Real time waiting time website to give you a gauge on the Fastpass timings instead of rushing across the park to realise that the Fastpasses have been snapped up. 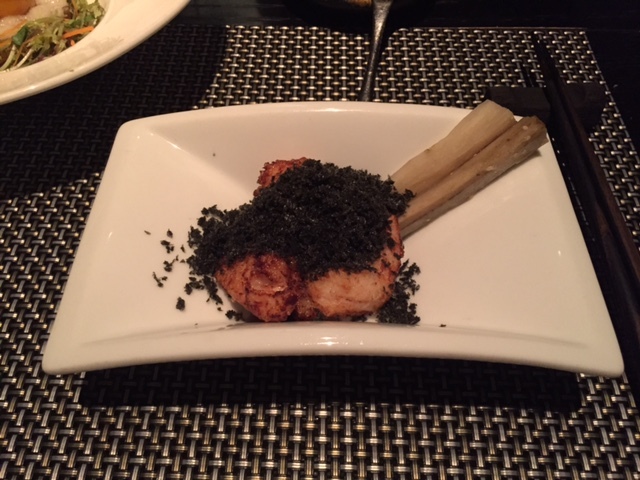 Don’t be put off by the Table Service Restaurants in Disney. They can be a total life saver and they serve pretty yummy food! 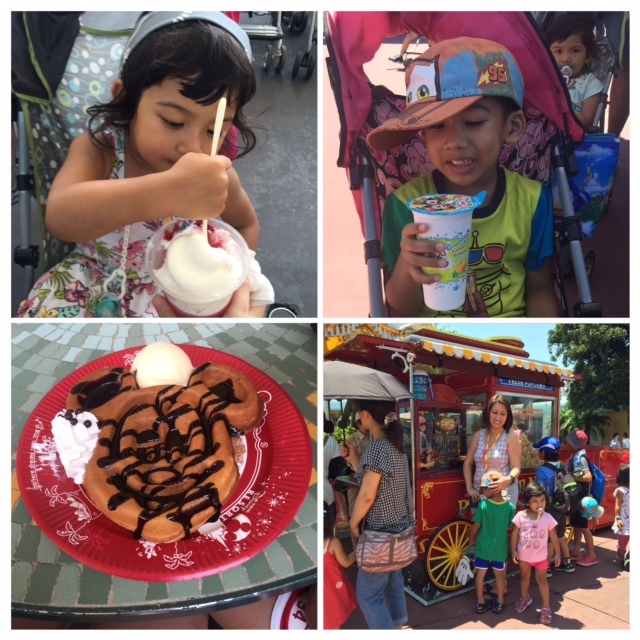 We were worried that the kids would not be able to endure a proper sit down meal especially with the prospects of rides and fun looming nearby or because they were cranky from the fatigue. I was proven wrong. 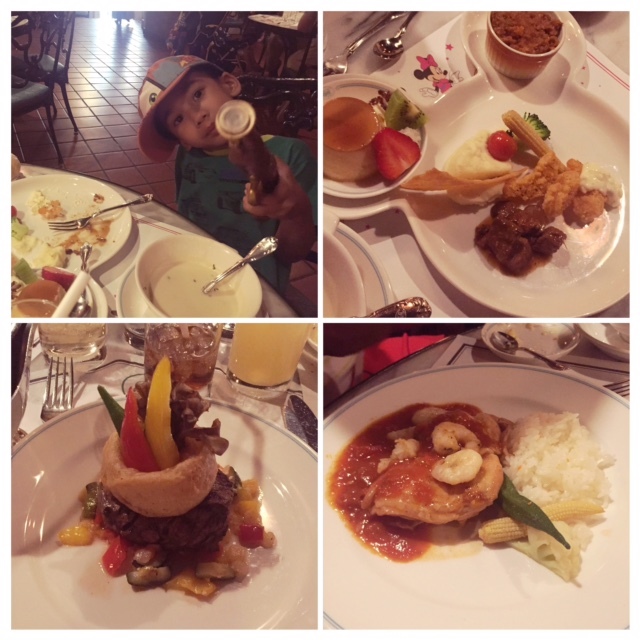 We tried 3 different table service restaurants – Blue Bayou which is a restaurant situated alongside the Pirates of the Carribean boat ride. We spotted the nice, cool, dim restaurant as we started our boat ride and Jah was hooked and needed to go have a ‘pirate’ meal. 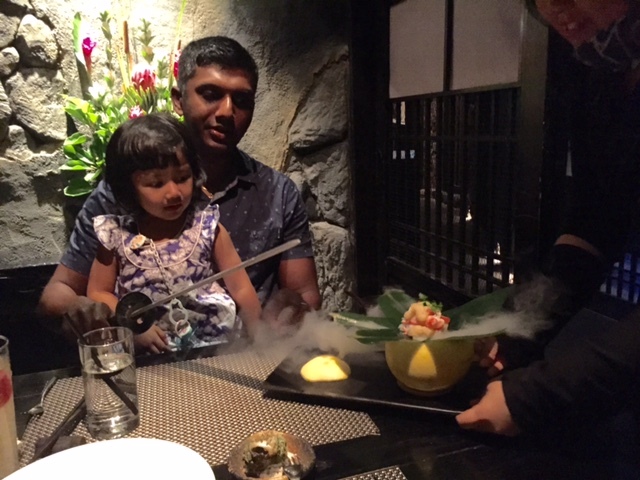 We had such a enjoyable time there that we were looking forward to our next Table Service meal. 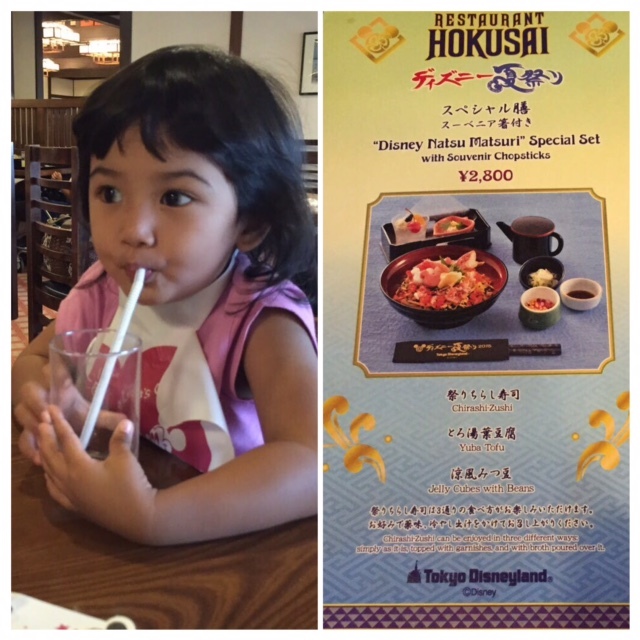 We also tried Hokusai – a Japanese restaurant and Eastside Dining – an Italian restaurant (both located near the entrance of Disneyland. The kids set at the Blue Bayou was pre cut into nice bite sized pieces!!! I didn’t have to waste time cutting them up for the kids! 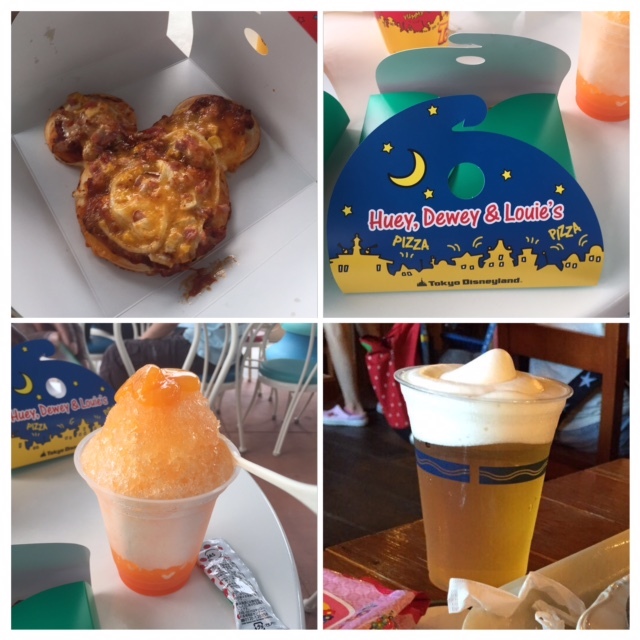 Eat in Disney – counter style, table service, pop up carts, character dining…try it all! I know some people may choose to leave Disney for meals or to bring in their own snacks. 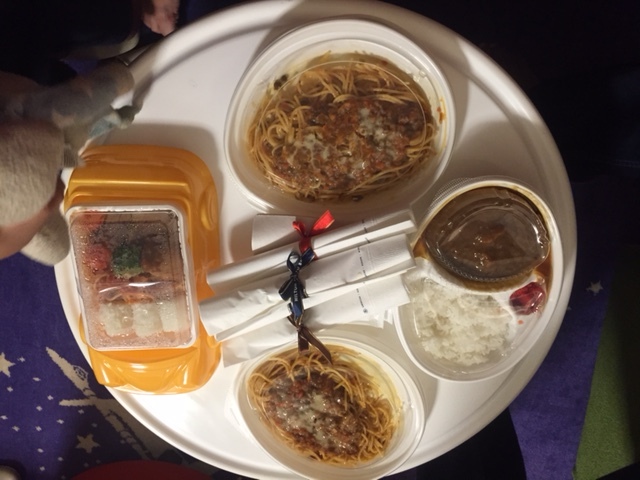 Trust me the food at Tokyo Disney is really not expensive compared to what you pay in the nearby malls and it really completes the experience. Furthermore no rushing back and forth. My one tip would be to eat early or find a place with not a long waiting time..you will be able to find something for sure. The queues and the service at the F&B outlets move pretty fast and seats get freed up pretty quickly because everybody is rushing off to their next ride. Super yummy pizza! Shaved Ice! 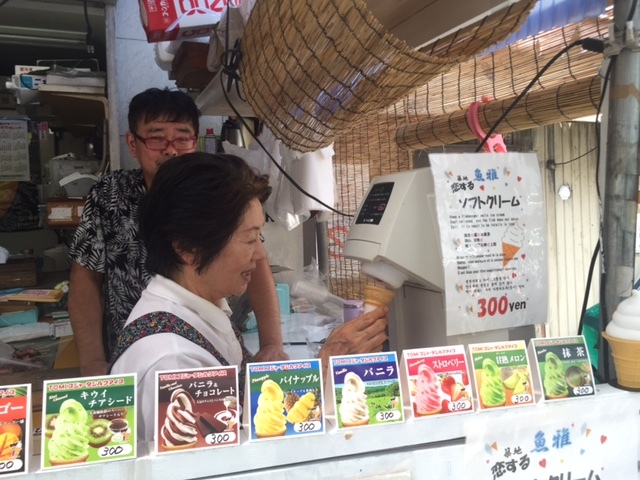 And a frozen Kirin beer for Papa Joel…yes frozen! 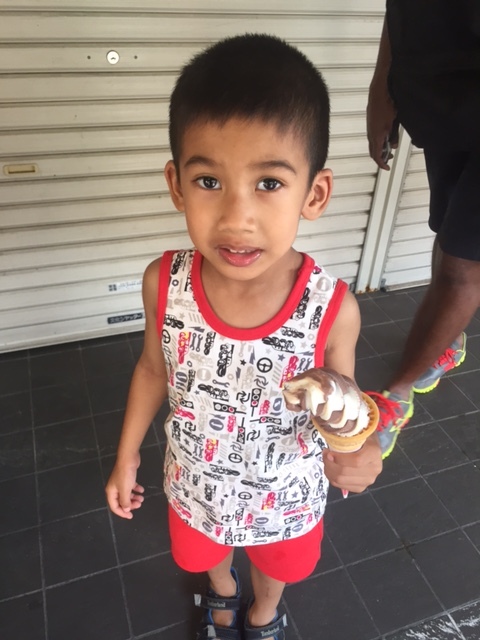 Ice cream! Flavoured ice cubes! Waffles! Popcorns!! Go for Crystal Palace Dining Character Buffet. 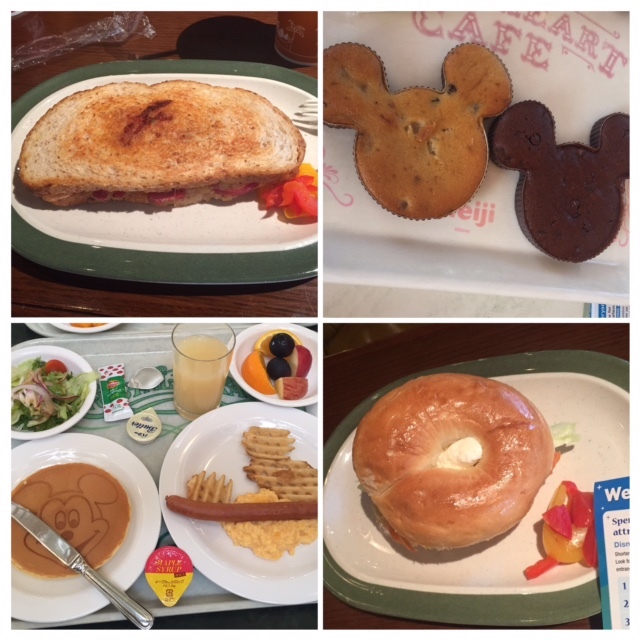 If there is one dining experience that you or your kids must have in Tokyo Disneyland, it would be the character dining. I screwed up big time because I had made a booking for a Dinner Showtime Character Dining experience but ended up mixing up the dates. As guilty as I was, I wasn’t about to queue for an hour just so that the kids could meet 1 character and take a photo so thank goodness, we found the next best thing. More on this experience in the coming entries. 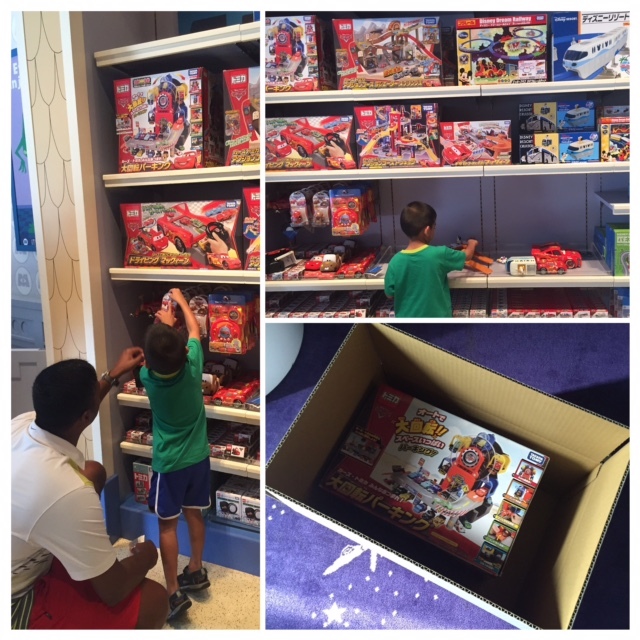 Shop at Disney before you shop at the toy stores in the city especially if your kid is a Takara Tomy fan. 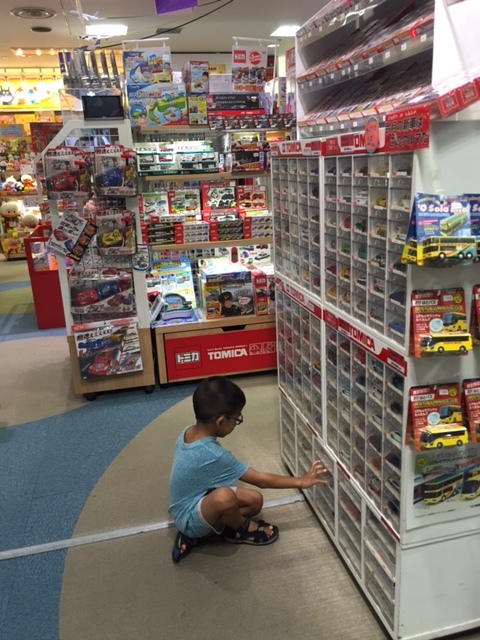 We made the mistake of shopping in the city before our Disney days and found lots of special Disney edition Takara Tomy cars and playsets which I have never seen in any Singapore or Tokyo toy store. Needless to say, we ended buying them as well on top of what we had already bought in the city. Some Disney products are actually very practical to-haves and are not just ‘merchandise’. Yes I used to scoff at the countless ‘merchandise’ that these theme parks try to sell us or our children at every turn. But I have to say that some of these ‘merchandise’ really do serve a purpose especially in the summer heat. 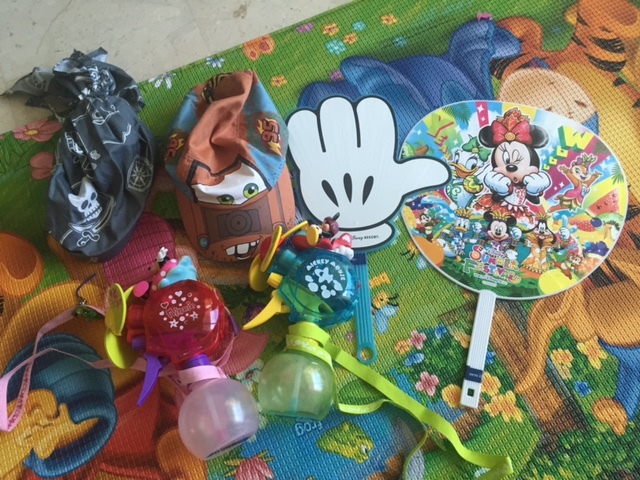 We loved the nice caps/ hats/ bandanas for the kids, the little fan mist sprayer as well as the big manual fans. 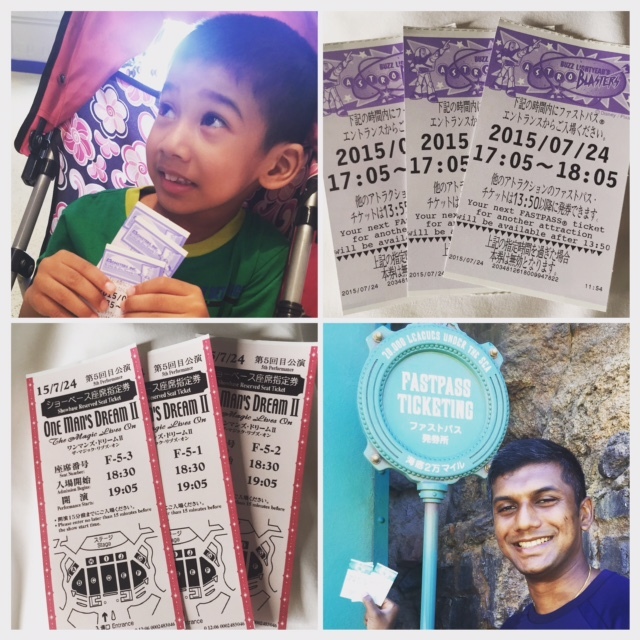 If your kids are my age than Disneyland is more suited for them over Disney Sea. 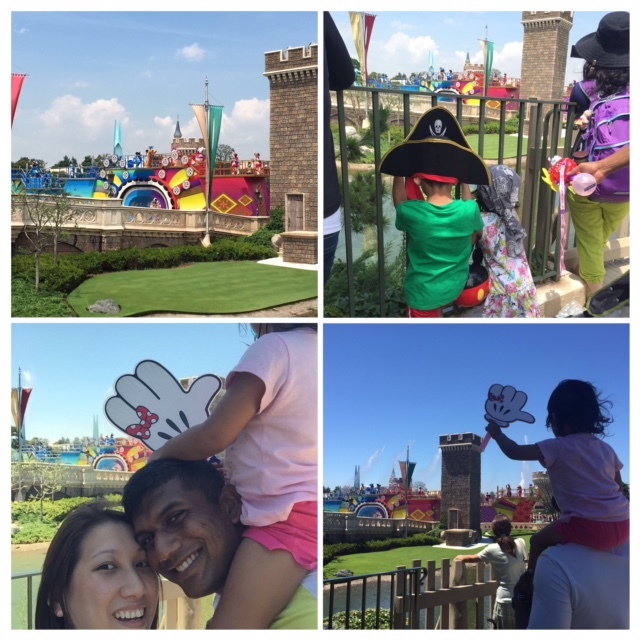 While we (the adults) loved the ambience and backdrop of Disneysea, we found the layout extremely frustrating. There were pretty much no short cuts to get from ‘land to land’ and there were only 2 routes (to the left or to the right of the harbour). 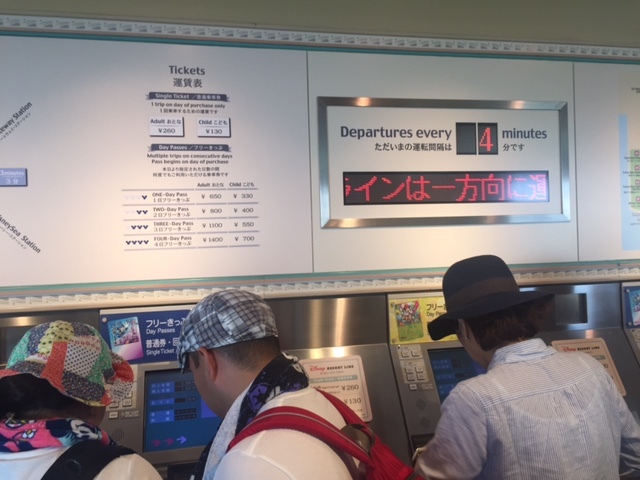 This meant that the ‘travelling time’ within Disneysea was a lot longer and more tiring when tiring to bring kids around. The rides were also less child-friendly or less interesting to the kids. 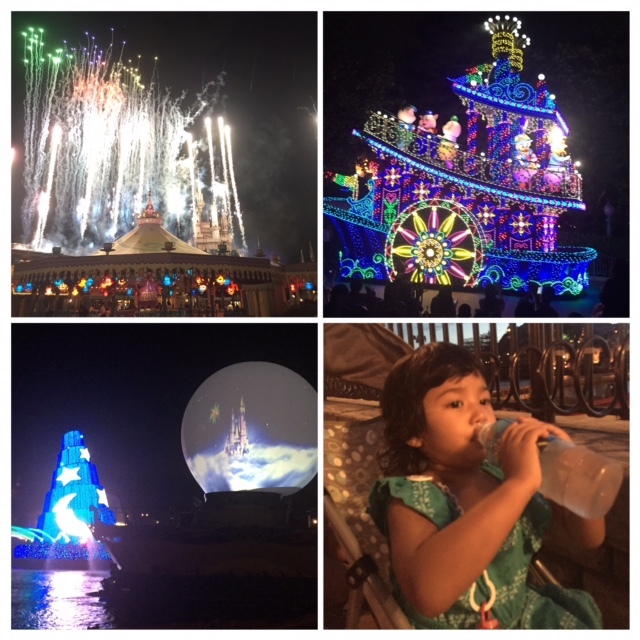 We concluded that Disneyland was more of a ‘ride place’ while Disneysea was more of a ‘show place’. Jah pretty much gave us the same feedback about his preference for Disneyland over Disneysea and we found ourselves in Disneyland for 3 out of the 4 days. Catch the Fantasmic show over the Dreamlights Parade While we preferred Disneyland over Disneysea, we would choose the Fantasmic show at Disneysea over all the other parades and show any day. If you only have time to catch 1 show during your Disney visit then it has to be the Fantasmic show. Totally worth it! We waited 1 hour for the show to start and it didn’t disappoint. It was so good that I didn’t take any photos until the end of the show and we had a fantastic view of fireworks right over our heads. Tip: The view to the left of the harbour is pretty awesome so wait along the sides where there are little canoes parked in the water rather than clamour for a spot that is front and centre of the harbour. You don’t always need a front view. While it would be awesome to be able to get front row front views of the parades and special shows all the time. After all the back drop of Cinderella’s castle always makes for a good photo. We realised on our trip that side views can be hidden gems as well. For one, you don’t have to queue early or wait hours on end (yes I mean hours, I have witness people sitting in the hot sun for 2-3 hours just to get those spots). So here are some hidden gems that we found. For stage shows that happen in front of the castle, we found that the ‘bridge’ on the left of the castle can be a nice shady spot to enjoy the entertainment. Though it would give you a back view of the characters, you can still hear the music and feel the vibe. Toon town is a good spot to wait for the Dreamlights parade. While you would be catching the tailend of the parade because it is the last stop that they hit before retiring behind closed ‘gates’, it brings you pretty close to the floats and I found that it is less crowded than the main street. If you can help it, don’t wait on the main street for the evening Disneyland Parade (Happiness on High) instead I would suggest you proceed towards Tomorrowland. There are less crowds waiting there and you are likely to find an open spot in the first row. We never caught the 830pm night castle show in front of Cinderella’s castle but we did catch a glimpse of the fireworks from behind the castle by chance. So if you are after a view of the fireworks but don’t think your kids can last through the show then hang out behind the castle, near the Carousel or Small Small World. 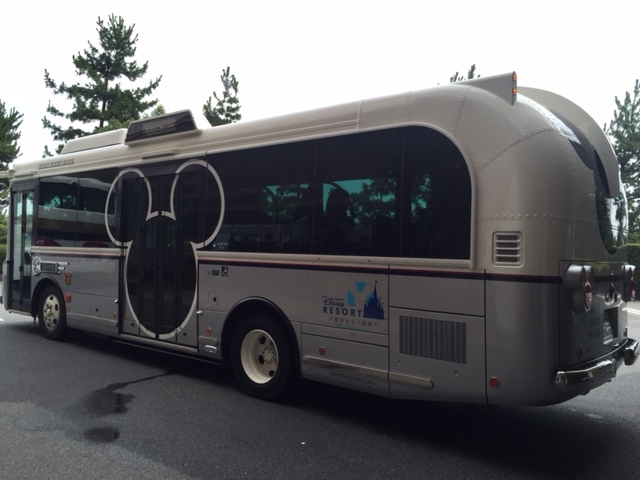 I hope these tips were helpful and that you enjoy Tokyo Disney as much as we did!